Does this vessel look like anything you have seen? Not sure if this is authentic or really anything? has a mark but I can’t really make out exactly what the first character is. I have received an email with the above photos from Brad in California. I guess he wanted to know more about the bottle he has bought. It is always difficult to judge an item based only on photographs. 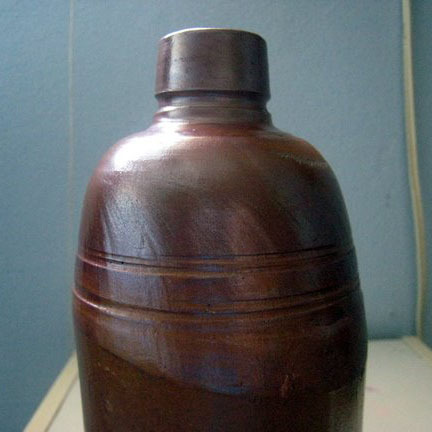 My initial impression is that of a Bizen sake bottle, but it looks very heavy and in my opinion, too thick for Bizen-ware. Comparing it with some pieces in my private collection of old Japanese pottery, which consists of 12th to 18th century pieces, including a few Tokoname jars of different periods as well as occasional odd pieces that come into my possession from time to time, I am inclined to say that Brad’s bottle was made in Tokoname. It was fired with coal with additional wood stoking, in a huge kiln called “secchuu-gama” which is a kind of nobori-gama. The measurements and the description given by Brad, as well as other tell-tale signs present on its surface, i.e. the thickness of the bottle combined with a thinly applied slip and the absence of a glaze are, for me, confirmation of its provenance. In addition, natural wood ash at the bottom shows a sign of upside-down packing in firing. I have no idea about the first initial of the stamped mark but it should take 0.7 litre of liquid. 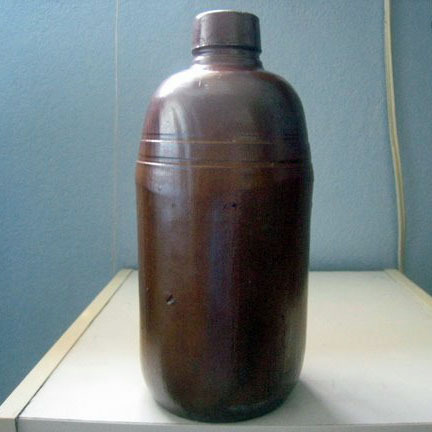 I would say it was a container for hydrochloric or nitric acid which was in great demand in Japan in the 1950’s. 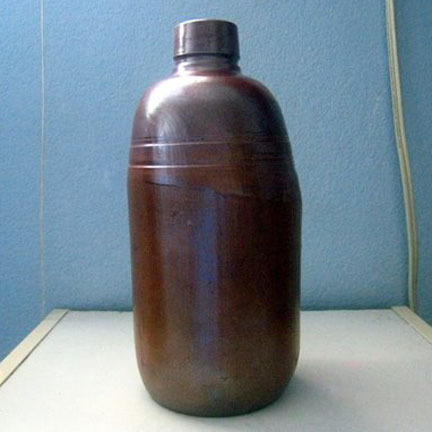 I have seen many bigger acid bottles with handles when I was only a kid. This is the best I could do without seeing and touching the bottle. I hope I gave Brad the answer he was looking for. 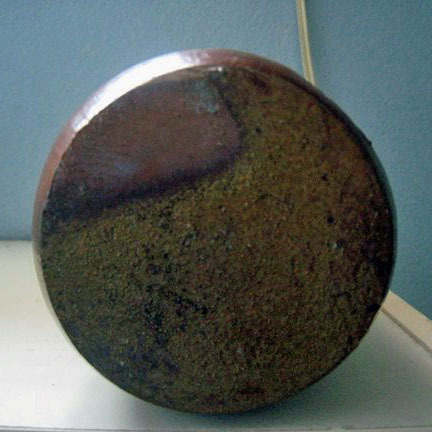 It is the best to see and handle an actual pot to identify what it is. Last year I had the chance to work at the Fitzwilliam Museum in Cambridge where I was invited to identify old Japanese pottery. Around 300 pieces of ceramics were examined and classified, among them many chawan and chaire (tea caddies); Dr. John Shakeshaft helped transcribe my words while Ching-Fen typed everything down. I managed to sort out most of them, but a few puzzling pieces still need to be researched further. I will tell you more about the treasures I found there if I get a permission from the museum. This entry was posted in anagamania and tagged Tokoname. Bookmark the permalink. Thank you for taking the time to answer the email about my puzzling bottle I recently found. 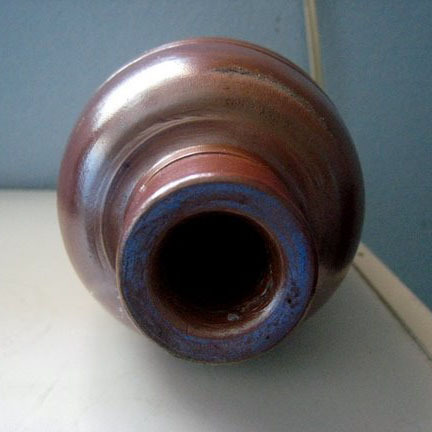 Someone else had also mentioned the possibility of this being a “Sake” type vessel. However, the shape of the opening does not really lend itself well to that purpose. 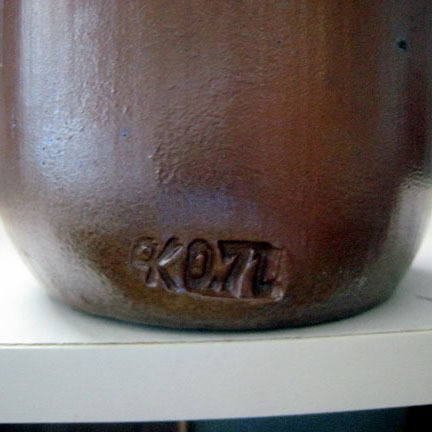 Classic Sake vessels are typically “fluted”. Your suggestion that this could possibly have been used to hold a type of caustic acid does make sense. Given how immensely heavy the vessel is (Approximately 1KG). Curious that it somehow ended up in a California thrift store shelf. I’ll do some more detective work with the information you have provided me. It was my pleasure to be able to help you. I would like to thank you for providing me with the measurements, the description and all images I needed to see. My text has been slightly altered. I am still not confident with my English (writing and speaking). That is the reason why I have a freiend who has been helping me to correct the sentences for my website and blog. Brigitte is another pottery enthusist.